A weekend in D.C. for my birthday was in the plans; a hurricane was not. With event after event cancelled, including Kate’s planned entry in the D.C. State Fair pie contest, and threatened by the potential wrath of Irene, there were only two things to do: put the gumbo pot on and mix up the hurricanes. It was all Southern and NOLA cooking for the duration. The chopping, stirring and slow simmering of Hurricane Gumbo allowed us to stay glued to coverage of the approaching storm. 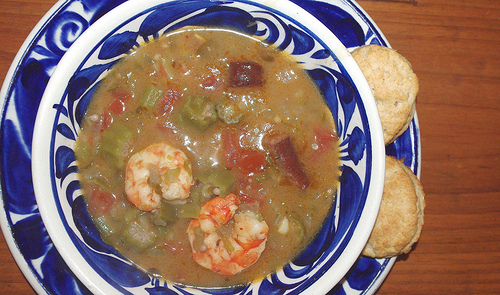 Gumbo is as hotly contested in the Bayou as barbecue is back home in Kansas City. (How dark the roux? Seafood, chicken or sausage? Okra haters or lovers in the house?) Combing through the cookbooks, we combined ideas for our own version featuring shrimp and Andouille sausage. Hurricanes were poured, using a recipe from Pat O’Brien’s in New Orleans, just as the rain and winds started picking up. These babies can pack a punch, true to their name. The next-door neighbor was slayed by one, but the cooks managed to slog through the rest of the batch. 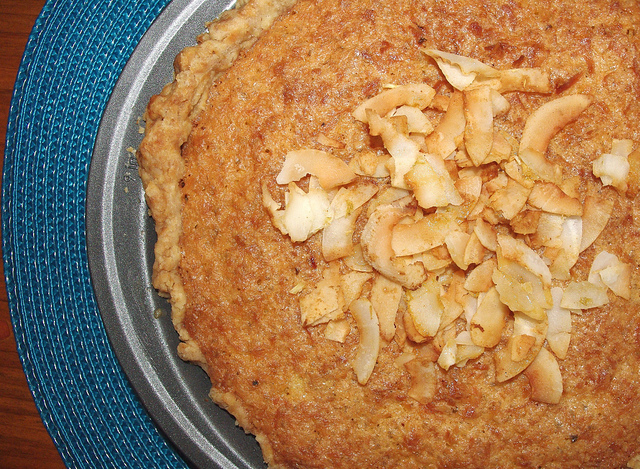 The beautiful chess pie intended for the State Fair kept us going as the winds began to howl and the trees bent toward the ground. Chess pie is an oft-forgotten Southern favorite with a filling that has a consistency reminiscent of pecan pie. Ah, but this chessie has some spectacular twists, to be revealed at a later date. The idea of Bananas Foster was also tossed around, as it always is. (For some reason, the classic New Orleans recipe of flambéed bananas in a rum sauce poured over ice cream turns up repeatedly in Kate’s life). Although with the fridge on the fritz and power outages a possibility, ice cream seemed a risk. 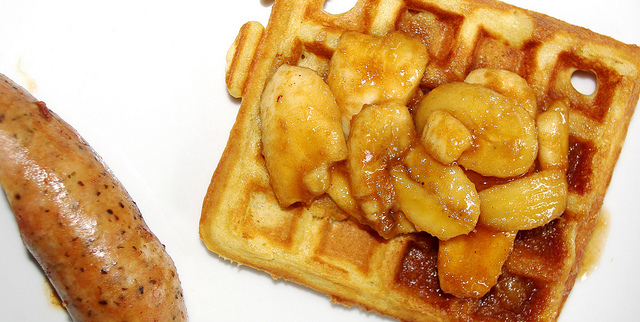 A brilliant solution emerged with Bananas Foster Waffles (of course, based on Brennan’s recipe) for Sunday brunch, served on homemade almond waffles with fresh kielbasa from Stachowski Brand Charcuterie on the side (thanks, guys for getting to the Columbia Heights Community Market on Saturday) and Bellinis made wtih fresh, market peaches and sparkling rosé. We sat down to a birthday toast as the sun emerged in a clear blue sky. The worst of Irene had passed us by. I’m with you, when things look dark… I make soup… it just makes you feel better. Those waffles would make me feel better too!! Imagine only being able to handle one drink!